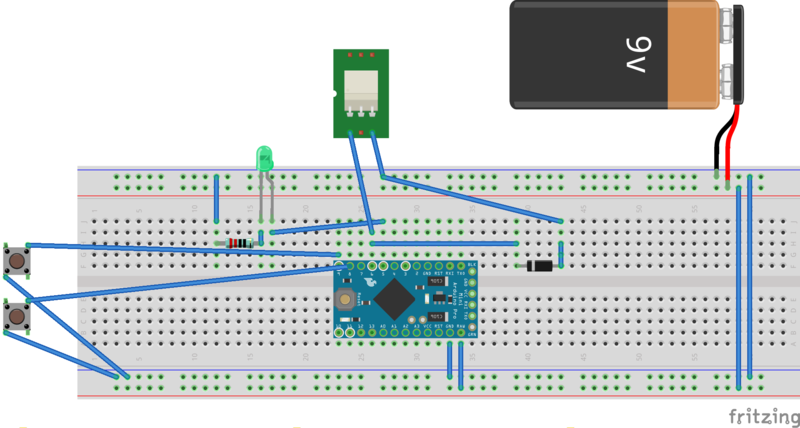 I am building a timer circuit using Arduino Pro Mini Atmega168p 5v 16MHz (which later supposed to be become to adjustable one). Here is the current breadboard view. Here is the program code I wrote. // LED to indicate timer is active. // It should be high when timer is active. // Button to start timer running. // Button to stop timer forcefully. // TODO: Make it volatile once timer has mdified as configurable. // Time period in milliseconds. // Configure pins for input push buttons. // Buttons are with pull up resistors so listening for 'falling' (voltage). // Timer elapsed the required time period. // So, stop the timer. // Nothing to do If timer is not running. The problem is timer does not work when pressing START button starting from third click. Two initial clicks works OK and timer functions as it should be. I think it does not wake up properly from sleep mode. However, wondering why it works for two initial clicks?? Please help me to identify the problem. I don't have much experience in writing Arduino code. Start by checking your calculation of time limits. I see you are mixing signed and unsigned arithmetics - not a very good idea. Check the blink-without-delay example for how to do that. The declaration of timer_start_time should be paid special attention. it is always very easy to solve this type of problems, if you just follow some common sense. 2) test individual blocks on their own. 3) integrate them into one functional program. don't co-mingle them day 1. tackle only what you can manage. no more and no less. Not the answer you're looking for? Browse other questions tagged interrupt arduino-pro-mini sleep or ask your own question. Wake up from sleep from pressed button?